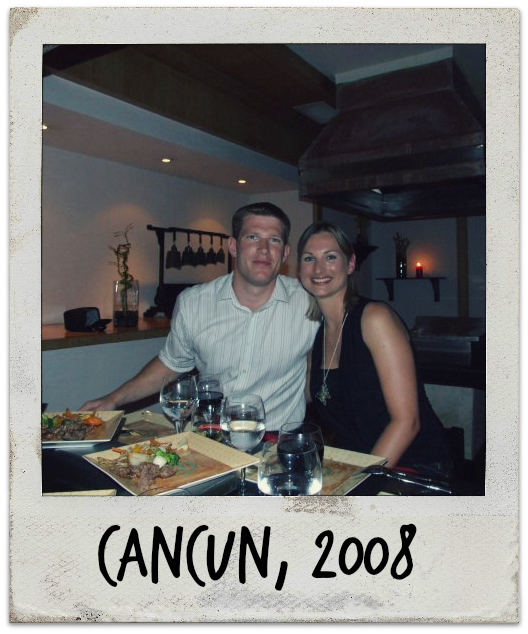 Each week I share a special memory from our travels during the past decade. My Travel Timehops have taken me back to dozens of moments to remember including the sights of Paris, cocktails in Las Vegas and shopping to replace lost luggage in Prague. This week I’m writing about one of the many scrummy meals we enjoyed during our honeymoon. It was August 2008 and we were celebrating just getting married with a two-week honeymoon. We were staying at the Secrets Capri in the Riviera Maya in Mexico. It’s tucked away to the south of the manmade party peninsula of Cancun. I love asian food – I think it’s something to do with living in Hong Kong as a toddler, although I’m sure my mum would say I just ate chips while we were there. Anyway, the Secrets Capri has a Pan-Asian restaurant, Himitsu, that we were keen to try out. Once during your stay you could arrange to have your meal cooked in front of you by a machete-wielding chef. Six of us sat around a red hot plate while the most amazing smelling ingredients were chopped together to create melt-in-your-mouth dishes. We ate with chopsticks, which I am terrible at (more proof that I just ate chips in Hong Kong) but I persevered and cleared my plate because it was so delicious. An amusing detail about this timehop moment is that if you look at the shelf to the left of Mr Tin Box you will see an open camera case. That’s ours. It’s still in Cancun because we forgot to pick it up after our meal. Luckily our spare memory card with more photos from our honeymoon was in a suitcase. Phew! I stayed just down the coast from Cancun about five years ago – such a gorgeous place to explore. And phew about the second memory card, I would have been gutted to lose my honeymoon photos! It would have been a tragedy. The thing is we did lose our honeymoon snaps a few years later in a hard drive incident. The only ones I have left are on Facebook. Low res but thank goodness we have something!